Good for the brain – and they are fun! Games for people with Alzheimer’s can be low-tech, high-tech, or anything in between. Every care community in the world probably has a Bingo game – and that’s about as low tech as you can get – yet Bingo has been shown clinically to have positive effects when played by Alzheimer’s and other people who have dementia. Bingo has many advantages as a game for people who have dementia. It comes not only in the familiar “B-6, N-23” version, but in a number of alternative schemes that are stimulating on different levels and for different abilities. Players can identify anything from animals or items of food, to body parts or playing cards. This variation allows for the game to be played, in one version or another, by people who are at different stages of the disease. Like so many games, Bingo can stimulate memories, thought process, and other cognitive functions. In 2007 I was just beginning my research into Alzheimer’s, trying to figure out what the disease was and why it effected a person the way it did; looking for best-care practices. Early in that search I came across a study in the American Journal of Alzheimer’s Disease and Other Dementia. The authors reported that playing Bingo provides mental stimulation that is highly therapeutic for people with cognitive disorders. Individuals participating in the study who played Bingo performed significantly better on measures of cognition than participants who did not play. Staff members reported increases in alertness and awareness in the test subjects, and this effect lasted for hours after testing was complete. Bingo is an ideal game for many people with dementia. It is enjoyed everyday by people of all ages, so it certainly is age-appropriate. Bingo is easy to understand and play, so it is stage-specific for anyone except those in the very last stages of the disease. The familiar game requires that the person distinguish letters and numbers. In some Bingo knock-off games it might be required to match colors and shapes, Regardless of the scheme, Bingo stimulates the brain. That is why the study above found playing the game improved cognitive functioning. Games for Alzheimer’s should be played for stimulation. The competitive aspect of the game should be de-emphasized. And Bingo is not just a game for large groups. It can be enjoyed by a group of two or three. Or even one (with a caregiver). Whenever possible and whatever the game, have children play with the older adults. Both age groups enjoy the stimulation and the social interaction. a computer based game called Smartbrain was shown to positively affect brain function in people with Alzheimer’s in an adult day facility in Spain. As reported in the Journal of Neurology, Neurosurgery, and Psychiatry, the game improved cognition in a group of elderly people diagnosed with Alzheimer’s. Smartbrain provides stimulation to cognitive facilities like attention and memory. It seems that even the diseased brain retains the ability to make new neurological connections. Since a computer game can be programmed to work on the needs and at the level of the person playing it, this technology holds some promise in the field of dementia care. Posit Science makes a product similar to the Smartbrain used in the study. Called Brain Fitness, it is being used successfully by several residential facilities in the U.S. to keep brains younger. And Nintendo has gotten into the game with a product called Brain Age. Though originally intended to improve the working of healthy brains, these products are proving to be effective therapy for people with dementia. Like everything computer, electronic games will not totally replace more conventional ones, but should be considered as an important addition to an activity program whenever possible. Games for people with Alzheimer’s disease should work on several levels. A board game with a colorful playing surface and objects that can be handled (cards, dice, etc.) is better than a game that does not contain these features; the more sensory stimulation the better (but be careful with objects that are small enough to be placed in the mouth). Many games involve a physical component. Physical exercise is another element to consider in selecting a game, but don’t choose all your games based on exercise. … results suggest that frequent participation in cognitively stimulating activities is associated with reduced risk of AD. And be sure to allow the people in your care to have a say in the selection process. A game that she played with her children when they were growing up, or one that she played as a child will likely hold a special attraction for a woman who’s memory of her past is more vivid than her memory of things more recent. That familiarity with the activity will serve to stimulate memories at the same time that it holds attention. And it gets even better if there little ones about to play along. 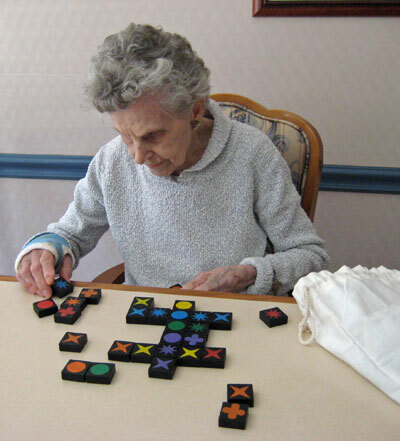 We chose the Qwirkle™ game for Bernice partly because the wooden tiles were an easy size for her to handle, and because she loved colors and shapes. Qwirkle is one of our favorite games because it can be enjoyed in so many different ways. Qwirkle is well suited for people with Alzheimer’s disease. The colors and shapes, set against the black background of the tiles are visually stimulating. Manipulating the pieces keeps the hands limber. Bernice loved to share what she created and ask for help and suggestions. This gave a topic to social interaction, something that can be difficult as dementia progresses. Qwirkle is a strategic game. Players create and build upon lines based on the same color or shape. The rules are a little involved, but people in early stages of Alzheimer’s could likely play the game as intended. In fact, it is great mental stimulation. In the picture, Bernice was approaching the later stage, and so she she arranged the tiles in any way she wanted; by color, and/or shape. Or she just created pretty patterns. PicLink consists of 36 tiles and instructions with a variety of fun ways to play. An added challenge is to invent your own ways to play. Designed specifically to benefit people with cognitive and memory impairment, PicLink is a wonderful game for younger people as well. The games are based upon exercises that research has shown improves brain connections and enhances memory. This Fragrance Bingo is a most original game! Follow Your Nose encourages exploration and discovery through the player’s sense of smell. Included are 30 distinct aroma diffusers in tamper-resistant flasks which players match to the corresponding image found on five brightly illustrated game boards. What we always liked about Follow Your Nose is that it involves the sense of smell. And it’s a game! It is difficult to create an activity that stimulates both the olfactory sense and cognition at the same time that it elicits memories. So you can see why we are so excited. Connect the past to the present with these games. Five “Shake Loose…” games are not only fun to play but can be a part of a comprehensive reminiscence therapy program. Developed by specialists in the field of gerontology and recreation, each easy to play game contains questions that will unlock memories as it provides hours of fun and social interaction. The games asks questions like, “Did your grandfather smoke, or did he dislike smoking?” Questions to stimulate discussion as well as memories. Wilson RS, Mendes de Leon CF, Barnes LL, et al. Participation in Cognitively Stimulating Activities and Risk of Incident Alzheimer Disease. JAMA. 2002;287(6):742-748. doi:10.1001/jama.287.6.742. Dr. Susan M. Landau, PhD, Mr. Shawn M. Marks, et. al. Association of Lifetime Cognitive Engagement and Low β-Amyloid DepositionArch Neurol. May 2012; 69(5): 623–629. Our data are consistent with the observation that participation in cognitively stimulating activities in early to middle life is associated with lower Aβ (Amyloid plaque – one of the causes of Alzheimer’s disease) accumulation. Verghese J, Lipton RB, Katz MJ, et. al. Leisure activities and the risk of dementia in the elderly. N Engl J Med. 2003 Jun 19;348(25):2508-16. Participation in leisure activities is associated with a reduced risk of dementia. The study study we referenced at the beginning of this page concluded that playing Bingo specifically provides mental stimulation that is highly therapeutic. Patients participating in the study performed significantly better on measures of cognition. Staff members reported increases in alertness and awareness for hours after testing. can i have some question sir? what is the best game application for the Alzheimer’s disease. this for the thesis project. we need some suggestions badly. Thank you. Have a nice day. There are some great free to play online games that appear very popular, entertaining and effective. My father worked with his hands. He was a machinist. I purchased big plastic children’s nuts and bolts. I would put them all together and asked him to undo them. As he was doing that I would screw the others back together. He thought it was part of his job. Good for you, Beth! We all like to think we are doing something important, and to your father was doing important work there. Dear members, I have developed a nice memory game (matching game) to improve memory and exercise your brain. It is a memory game with your own pictures. The game is using your own pictures as the cards. So this is great way to watch and explore your pictures while exercising your brain. Great quality time you can spend with your kids, grand kids and friends, while looking at each other’s pictures. You can play against time, or click “Stop it!” to play with no rush to enjoy every picture. Can enlarge pictures for full screen by a long-click. Hope you and your family enjoy that game while exercising your brain. I developed 2 games for my mum and other residents who had dementia and lived in a care home. I had a pack of cards that had animals and shapes on each card. They could be used for SNAP, or turn over about 10 pairs of cards face down and ask them to memorise were each one is as they turn them over. A matching pair is given to the person and you can how many pairs each one has. Using the same cards you could ask them to identify them and ask them swap with each other to make pairs ensuring that each of them had the opportunity to make up pairs. Does anyone have a …. and take it in turns to ask. Using the same cards I gave one card to each of 6 residents and asked them to tell me something about it . We had a lion roaring, a cat meowing and when we came to the shape of the sun we started singing “You are my sunshine.” This game was good fun for them as it turned into a singing session for about 20 minutes. Would the game of MONOPOLY constitute as an example of one of these board games , that would could assist an individual within the early stages of Alzheimer’s ? I’m sure dietary habits, as well as , hydration .. are , can also be considered as contributing factors .. but , I’m simply attempting to get a ” head start ” , into my research into this matter of medical / physical state . All feedback will be welcomed , as well as , appreciated. Sure, Monopoly can be cognitively stimulating (counting money, counting moves, etc. ), and it also has a social aspect. It may be a little lengthy, but it can be played in stages, and you don’t have to finish every game. Be sure to explore our website thoroughly; Lots of information there. A game was advertised on Breakfast BBC1 this morning 4th May ’16. It was a study of peoples ages and gender. I cant find this game anywhere as it wasn’t very well stated. Can you help me? Hi Marion, Thank you for contacting us. I’m sorry that I can’t help you. We don’t get the same programming here in the United States that you get. Possibly you can contact the TV station and someone can help you. Looking for games for people with dementia who basically have little skills left no memory at all. Thanks for any helpful ideas. Bingo games didn’t work it’s all care givers doing everything residents looking at cards and just lost. Finding a game or any activity for a person with dementia is much like finding something for anyone esle. The individual’s interests and personality have to be considered as well as his or her ability. Sometimes interests and personality change with the progression of dementia. Those who work with and are closest to someone are in the best position to predict the kinds of activities that might be enjoyed. Everything in our store has worked as an appropriate activity for dementia, but not all are right for everyone. Feel free to contact us (877/300.3021) or info@best-alzheimers-products if you need some ideas for your particular situation. Often times, it comes down to sensory stim activities. Soft brushes on hands and arms, smells (essential oils), lotions, soft music, foot massage. Even when they cannot respond or participate much, they can still hear and feel. I really loved the Alzheimer Song ! Please don’t let me forget you ! !, where can I purchase it? As a principal supplier of smaller bingo machines and supplies to the seniors market we have seen considerable growth in this sector especially with seniors homes, seniors apartment towers and community centres. We see first-hand that in addition to the mental challenge of quickly looking for numbers to mark, bingo requires a certain level of hand eye coordination. Most seniors still get a kick out of being able to compete against their piers for the thrill of winning. I have been looking for larger tiles for the game Tri-ominoes. My residents love this game, but need larger pieces so we can play in a group. Any ideas? “CHOICE WORDS” – – sometimes my fingers don’t type as I wish they would. Ha! Depression in people with dementia can often be attributed directly to inactivity and under-stimulation. I know I get depressed when I have nothing meaningful to do for extended periods of time. The best answer to your question is “anything that will keep them involved and stimulate their brains and their senses.” The trick is finding something they like, as without interest there is little involvement. Singing or playing music. I did a paper on how music stimulates the brain of dementia and Alzheimer’s patients. It’s amazing what music does for the brain, isn’t it? I’d love to read your paper. Dr Ron Rea and I are conducting a workshop on improving quality of life for Alzheimers patients. I am interested in talking with program developers in your shop re assumptions and research that have guided your company in developing games to help caregivers stimulate their patients. We could discuss displaying some of your games if you feel that would be beneficial to your company and our presentation. The best number to reach me is my cell….803 333 9759. Thanks for your input, Nolan. You make some interesting points. We often do things too late, as you say of attempts to use brain games to curtail the effects of Alzheimer’s disease. But there are studies that link stimulating games (and other habits and life choices) to lower incidents and/or later onset of dementia. Most organizations that concern themselves with dementia make mention of things we can do to help avoid brain diseases starting at a very early age, and we certainly do so on this blog (see https://www.finddementiaproducts.com/can-turmeric-cure-alzheimers.html, https://www.finddementiaproducts.com/can-we-prevent-alzheimers-disease.html and more to come). I’m not sure that “the intensity of competition” is a factor in this case. “…sweating the outcome” of bets made against other players, while invigorating, likely have nothing to do with the type of stimulation that is so beneficial to brain health; it may or may not be good for the heart. In fact there is a direct correlation between stress and dementia, so it could even be counter-productive.